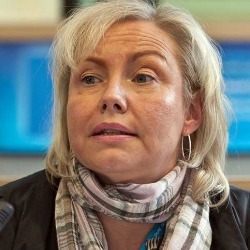 Ariane Rodert is Vice-President for Group III of the European Economic and Social Committee (EESC) and appointed as a EESC member by the Swedish government representing civil society interests. In this capacity she represents the Swedish civil society umbrella, Forum – idéburna organisationer med social inriktning, gathering civil society umbrellas in the social sector, social economy and non-profit welfare stakeholders. She is also Senior Policy Adviser at the Secretariat of the Archbishop and General Secretary for the Church of Sweden. Ariane’s key areas of expertise in the EESC and at European level are social economy enterprises, social innovation and social investment. She has drafted several key opinions on the subject, most recently on the financial eco-system for social economy enterprises on request by the Luxembourg EU Presidency, and is currently drafting an EESC opinion for the Netherlands EU Presidency on innovation and business models. Ariane coordinated the EESC Social Enterprise Project and is often consulted on these topics by the European institutions and Member States. She is Vice President of the EESC internal market section, the EESC representative in the European Commission high level expert group GECES and a member of the EESC Permanent Study Group for Social Economy Enterprise and the EESC Social Economy Category Group. Ariane holds a Master of Science degree in Business and Economics from the University of Stockholm.